Concrete is a stone like substance obtained by permitting a carefully proportioned mixture of cement, sand and gravel or other aggregate and water to harden in forms of the shape and of dimensions of the desired structure. Since concrete is a brittle material and is strong in compression. It is weak in tension, so steel is used inside concrete for strengthening and reinforcing the tensile strength of concrete. The steel must have appropriate deformations to provide strong bonds and interlocking of both materials. When completely surrounded by the hardened concrete mass it forms an integral part of the two materials, known as “Reinforced Concrete”. 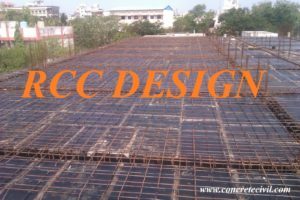 Reinforced Concrete is a structural material, is widely used in many types of structures. It is competitive with steel if economically designed and executed. Reinforced concrete also has greater compressive strength as compared to most other materials used for construction besides good in tension. It has better resistance to fire than steel and capable of resisting fire for a longer time. Less skilled labor is required for erection of structures as compared to other materials such as structural steel. It has low compressive strength as compared to steel (the ratio is about 1:10 depending on material) which leads to large sections in columns/beams of multistory buildings Cracks develop in concrete due to shrinkage and the application of live loads. The design of a structure may be regarded as the process of selecting proper materials and proportioned elements of the structure, according to the art, engineering science and technology. In order to fulfill its purpose, the structure must meet its conditions of safety, serviceability, economy and functionality. It is based on the ultimate strength of the structural members assuming a failure condition, whether due to the crushing of concrete or due to the yield of reinforced steel bars. Although there is additional strength in the bar after yielding (due to Strain Hardening), this additional strength in the bar is not considered in the analysis or design of the reinforced concrete members. In the strength design method, actual loads or working loads are multiplied by load factor to obtain the ultimate design loads. The load factor represents a high percentage of factor for safety required in the design. The ACI code emphasizes this method of design. This design concept is based on elastic theory, assuming a straight line stress distribution along the depth of the concrete. The actual loads or working loads acting on the structure are estimated and members are proportioned on the basis of certain allowable stresses in concrete and steel. The allowable stresses are fractions of the crushing strength of concrete (fc’) and the yield strength (fy). Because of the differences in realism and reliability over the past several decades, the strength design method has displaced the older stress design method. The aim of this analysis is to ensure that no limiting sate will appear in the structural member during its service life. Strain in concrete is linearly proportional to the distance from the neutral axis. Modulus of elasticity for all grades of steel is taken as Es = 29 x 10 ^ 6 psi. The stress in the elastic range is equal to the strain multiplied by Es. Plane cross sections continue to be plane after bending. Concrete’s tensile strength is about 1/10 of its compressive strength. Cracked concrete is assumed to be not effective Before cracking, the entire cross section is effective in resisting the external moments. The method of elastic analysis, assuming an ideal behavior at all levels of stress is not valid. At high stresses, non-elastic behavior is assumed, which is in close agreement with the actual behavior of concrete and steel. At ultimate strength, the maximum strain at the extreme compression fibers is assumed to be equal to 0.003 by the ACI code provisions. At the ultimate strength, the shape of the compressive stress distribution may be assumed to be rectangular, parabolic or trapezoidal. Structural members must be designed to support specific loads. Loads are those forces for which a structure should be proportioned. Loads that act on structure can be divided into three categories. Dead loads are those that are constant in magnitude and fixed in location throughout the lifetime of the structure. It includes the weight of the structure and any permanent material placed on the structure, such as roofing, tiles, walls etc. They can be determined with a high degree of accuracy from the dimensions of the elements and the unit weight of the material. Live loads are those that may vary in magnitude and may also change in location. Live loads consists chiefly occupancy loads in buildings and traffic loads in bridges. Live loads at any given time are uncertain, both in magnitude and distribution. Consists mainly of snow loads, wind pressure and suction, earthquake loads (i.e inertial forces) caused by earthquake motions. Soil pressure on subsurface portion of structures, loads from possible ponding of rainwater on flat surfaces and forces caused by temperature differences. Like live loads, environmental loads at any given time are uncertain both in magnitude and distribution. Structural members must always be proportioned to resist loads greater than service or actual loads, in order to provide proper safety against failure. In the stenght design method, the member is designed to resist the factored loads which are obtained by multiplying the factored loads with live loads. Actual strength from the material properties is called the nominal strength. As safe design is achieved when the structural strength obtained by multiplying the nominal strength by the reduction factor Ø, exceeds or equals the strength needed to withstand the factored loads. Slabs are horizontal slab elements in building floors and roof. They may carry gravity loads as well as lateral loads. The depth of the slab is usually very small relatively to its length and width. Long horizontal or inclined members with limited width and height are called beams. Their main function is to transfer loads from the slab to the columns. Columns are vertical members that support loads from the beam or slabs. They may be subjected to axial loads or moments. Frames are structural members that consists of combination of slab, beams and columns. Footings are pads or strips that support columns and spread their load directly to the soil. Code is a set of technical specifications and standards that control important details of design and construction. The purpose of code is to produce sound structures so that the public will be protected from poor and inadequate design and construction. Frther the ACI code defines a tension controlled member as one with a net tensile strain greater than or equal to 0.005. The coresponding strength reduction factor is Ø = 0.9. For compression controlled members as having a net tensile strain of less than 0.002. The strength reduction factor for compression controlled members is 0.65. 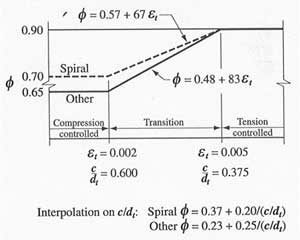 A value of 0.70 may be used if members are spirally reinforced and ACI code allows a linear interpolation of Ø based on as shown. If the external moment applied on the beam is very small and the dimensions of sections are specified (as is sometimes required architecturally) and are large than needed to resist the external ultimate moment, the calculations may show that very small or no steel reinforcement is required. In this case the maximum tensile stress due to bending moment may be equal to or less than the modulus of rupture of concrete. If no rinforcement is provided, sudden failure will be expected when the first crack occurs, thus giving no warning. ACI code specifies a minimum steel area. If Mu required > Md of simply reinforced beam . Proceed with doubly reinforced beam design. Check whether the compression steel is yielding or not and use the corresponding stress in the steel for calculating the forces and moments. If compression steel is less than fy, then the compression steel area is to be revised ==> As’ fs’ < As’ fy ==> increase As rev. The revised compression steel area acting at fs must provide the same force as the trial steel area that was assumed to act at fy. Tensile steel area need not to be revised because it acts at fy, as assumed. Select appropriate bar size and draw the sketches. Stay with this guys, you’re heplnig a lot of people.